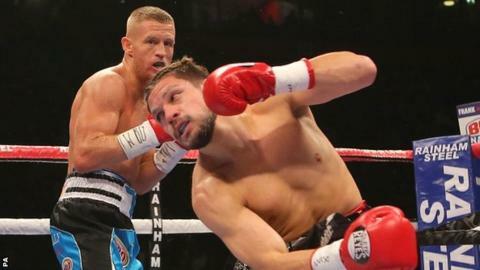 Britain's Terry Flanagan defended his WBO lightweight crown in stunning fashion by knocking out America's Diego Magdaleno in the second round. The undefeated Manchester fighter, 26, earned the WBO title by a technical knockout against Jose Zepeda in July. And he stopped Magdaleno, 28, after catching him with a pounding left hook. Earlier, Liverpool's Liam Smith earned his first WBO light-middleweight title after defeating American John Thompson with a seventh-round knockout. Flanagan came into the fight with 28-0 record but Magdaleno was considered the biggest test of his career after Zepeda retired injured in his previous title fight. But the British southpaw was untroubled in front of his home fans at the Manchester Arena and finished off Magdaleno with a flurry of punches before the referee stepped in. "After his first knockdown I didn't go down too daft but after I caught him with another few shots I knew he was there for a taking," Flanagan said of his opponent, who had lost only once in his previous 27 fights. "A few people said I didn't deserve to be world champion but I proved tonight that I am a true world champion." Smith, who is undefeated in 22 bouts, took more time to seal his first world belt and appeared to be behind to his New Jersey opponent after five rounds. But after landing a left hook in the sixth, he then sent Thompson, 26, sprawling to the canvas with a straight right. The 27-year-old is one of four boxing brothers and the first to win a world title. "He was coming apart as the fight wore on, as soon as I got into my rhythm, I got him," Smith said. "It was my type of part the longer it went. "It was seven years to the day that I made my professional debut, so I'm so very proud."